Both listeners of electronic music since childhood, Victor and Ruben met at 15 years of age in school, where they shared their musical tastes and different songs they heard. Influenced by artists like Eric Prydz and Swedish House Mafia, they began to produce their own music. In early 2012, they began making house music, specifically progressive house. That same year, they signed to Monstercat, and released their song "Heartbeat" with Collin McLaughlin, which was very well received by the public. To date, they have remixed the likes of world-renowned artists such as Adele, Calvin Harris, Maroon 5, and Zedd. In July 2013, they went on the Nothing Toulouse: North American Tour by Nicky Romero, where they performed as a supporting act for him, and, in October, they were also part of the Protocol Recordings ADE 2013 Label Night line-up. In November of that year, they joined the duo of Australian producers Nervo on their #NERVOnation tour in Mexico. In 2014, Vicetone opened the year with releases on Spinnin' Records, including their tracks "Lowdown" and "Ensemble". They also had other high profile releases on Nicky Romero's Protocol Recordings and Hardwell's Revealed Recordings. They also performed at the 2014 edition of the Ultra Music Festival. Their major breakthrough that year, however, came with the release of their first Beatport #1 overall charting track "Let Me Feel", that was a collaboration with Nicky Romero. Later that year, they performed at the TomorrowWorld festival in Atlanta. Vicetone also announced that they had also composed the single "United We Dance" as the soundtrack for the 2014 Ultra Music Festival aftermovie, which they then released on Ultra Records. 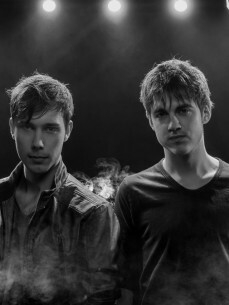 For their final track of 2014, Vicetone released their track "What I've Waited For" through Monstercat.